In a small pot over medium heat, add the berries and orange juice and cook, stirring frequently, until the berries fall apart and the sauce thickens, around 10 minutes. Add the honey and stir for 1 minute. Remove from heat. 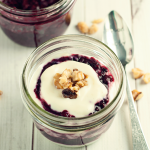 In a small cup, add a couple tablespoons of the yogurt, followed by a couple tablespoons of the warm berry compote. Repeat until the yogurt container is empty, then top with a handful of chopped walnuts. Enjoy!